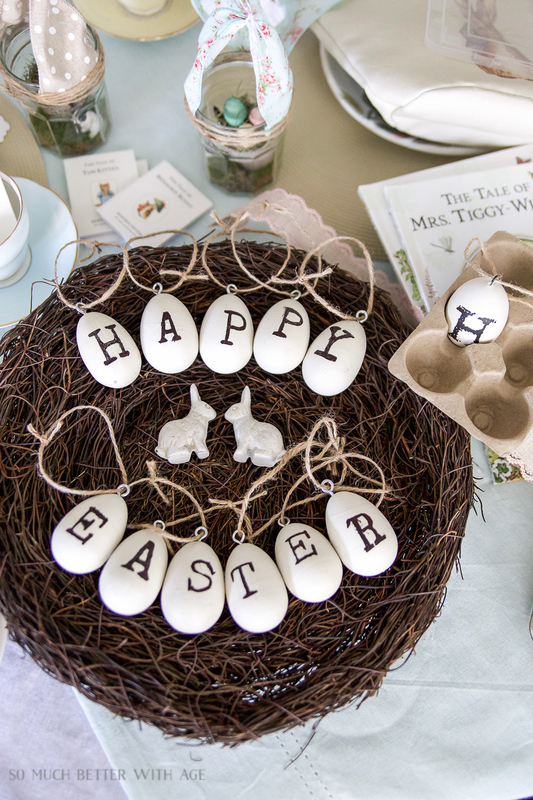 How to make your own DIY vintage ‘Happy Easter’ eggs! Nothing makes my vintage loving heart pitter patter more than when I come across something putty coloured with vintage-y looking typewriter font. 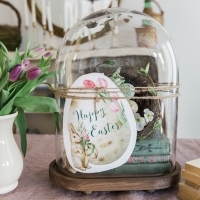 I bought these Easter eggs from Pottery Barn years ago and wanted to see if I could recreate them. 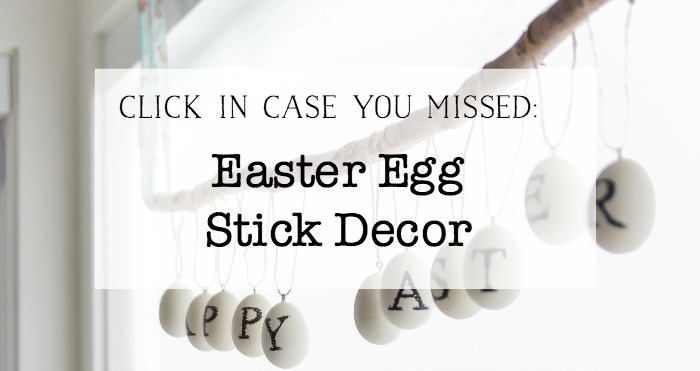 I used them recently in my Easter egg decor stick. 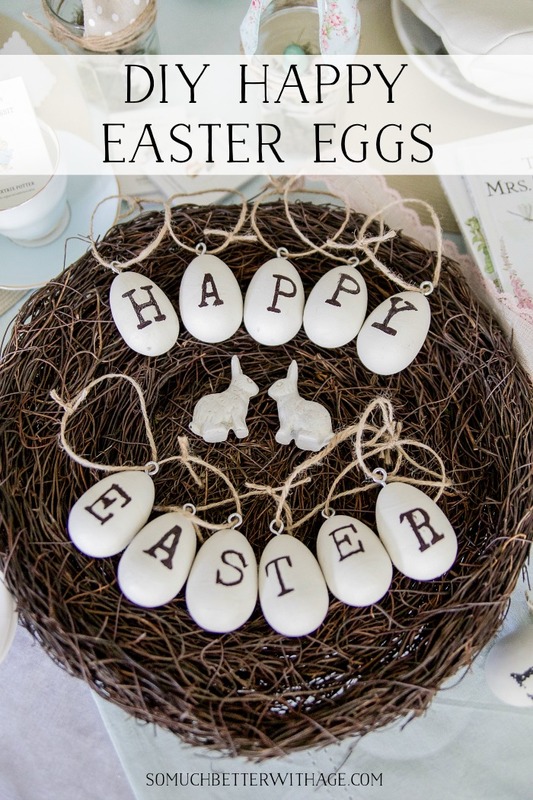 I’m also joining friends to share our Easter crafts and DIYs. 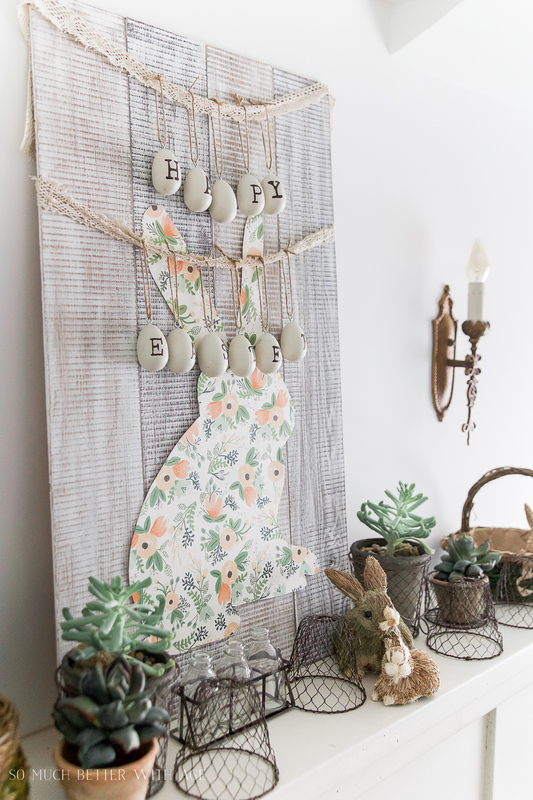 Thank you Annie from Zevy Joy for organizing this blog hop! 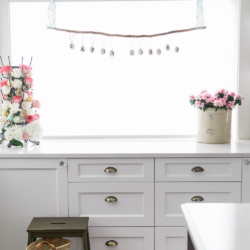 Be sure to check out all the crafts/DIYs at the end of this post. 1. Pre-drill the top of each egg with a screw and screwdriver. 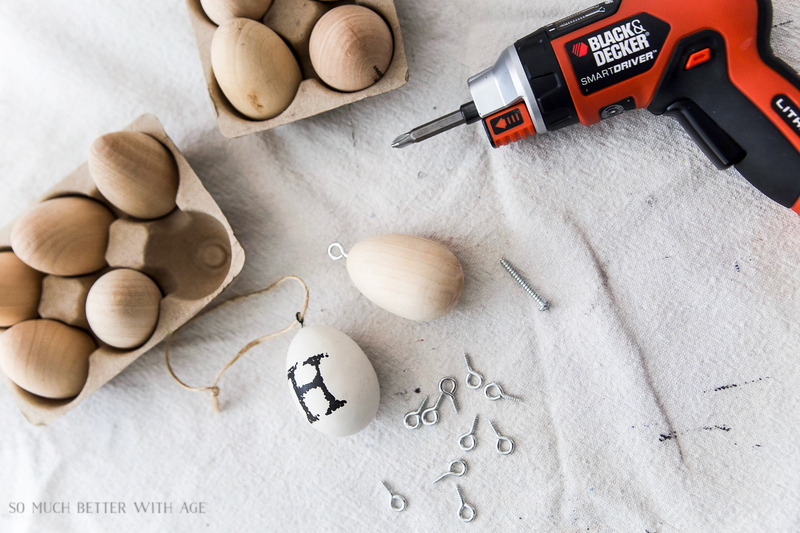 It’s best to put it in a vice or you can keep it in the egg carton to hold it while drilling. 2. 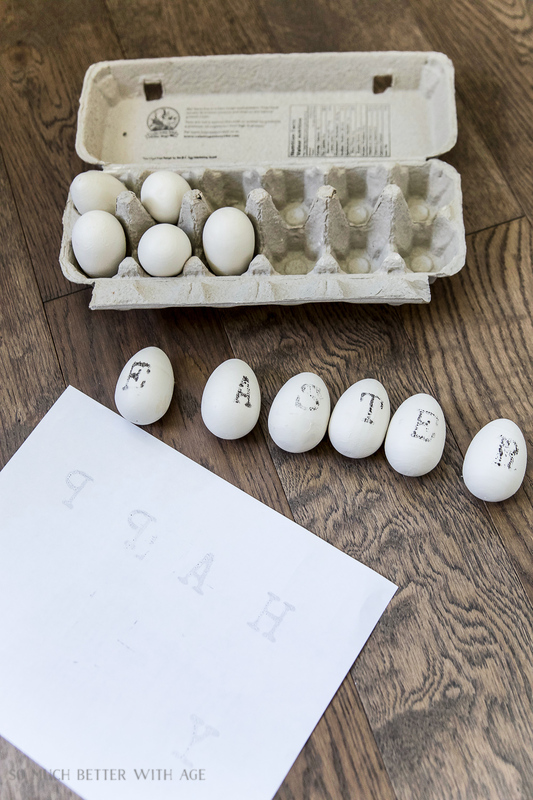 Paint half of each egg (so you have room to hold it). Once dry, paint the other half. 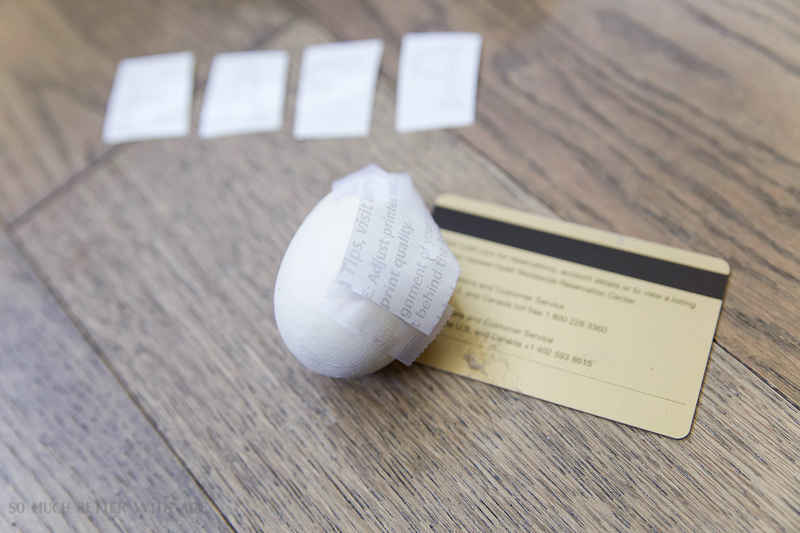 Let dry in a egg carton. I like the bit of texture both paints add to the eggs. 3. 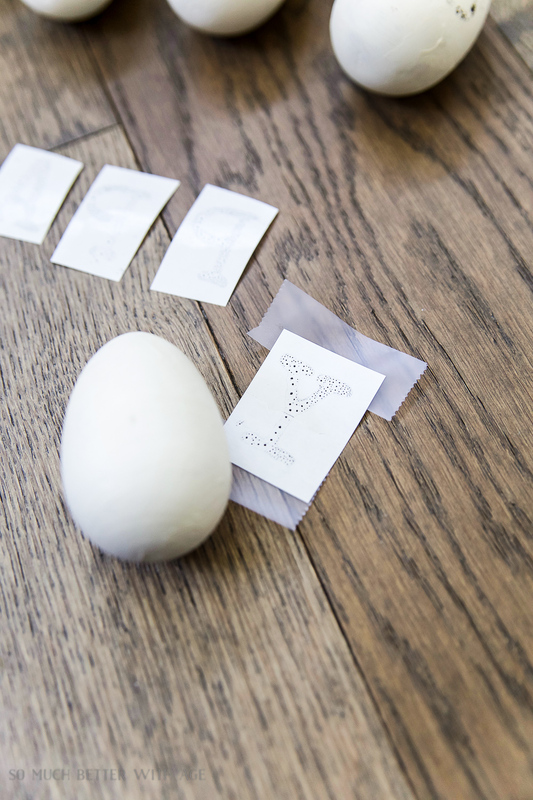 Following this same tutorial, print the download below on Avery backing paper or wax paper from your home printer. 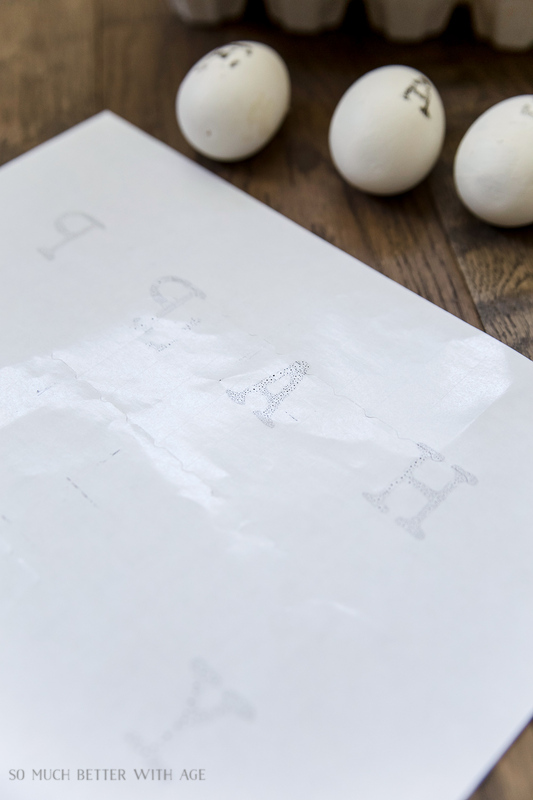 The ink doesn’t dry (or takes a long time to dry) on wax paper so be careful not to touch the ink or it will smudge and you’ll have to print it over again. 4. 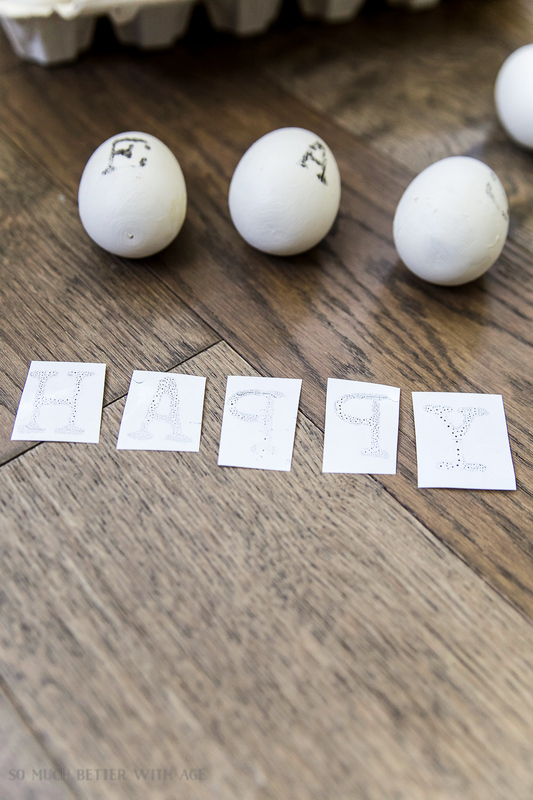 Cut out each letter and tape a letter to an egg rubbing a card over the letter to imprint the letter onto the egg. The letters are reversed so make sure they go on reversed. I almost put the E upside down. 5. 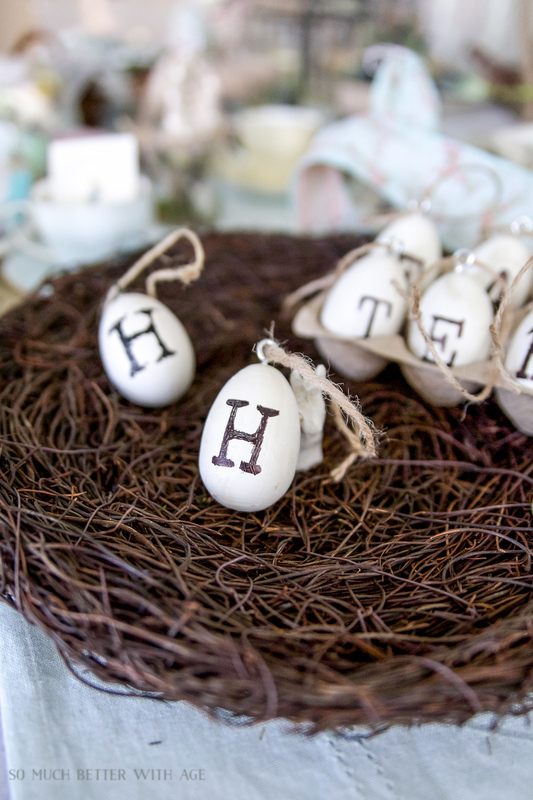 Using a fine tip Sharpie, color in the rest of the black letters on the egg. It doesn’t have to be perfect. The more ‘imperfect’ the better as you want to recreate the old typewriter font. 6. 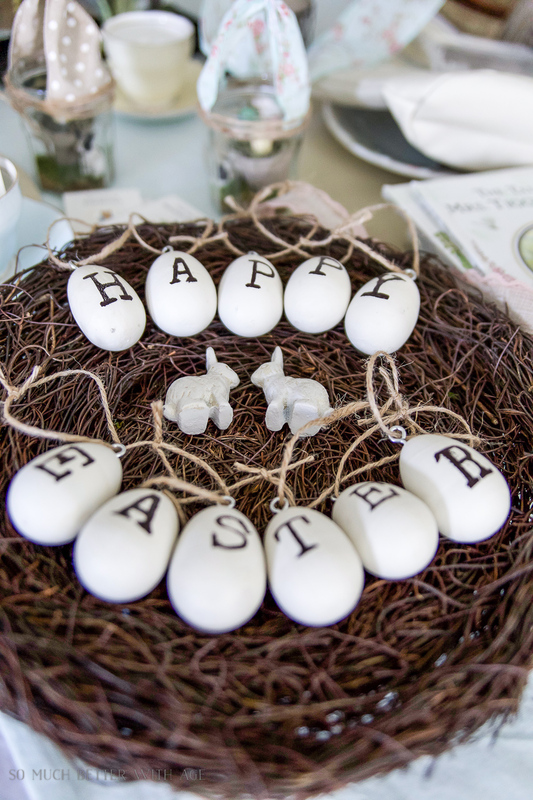 Screw an eyelet screw into the top of each egg and thread some jute twine through each screw. 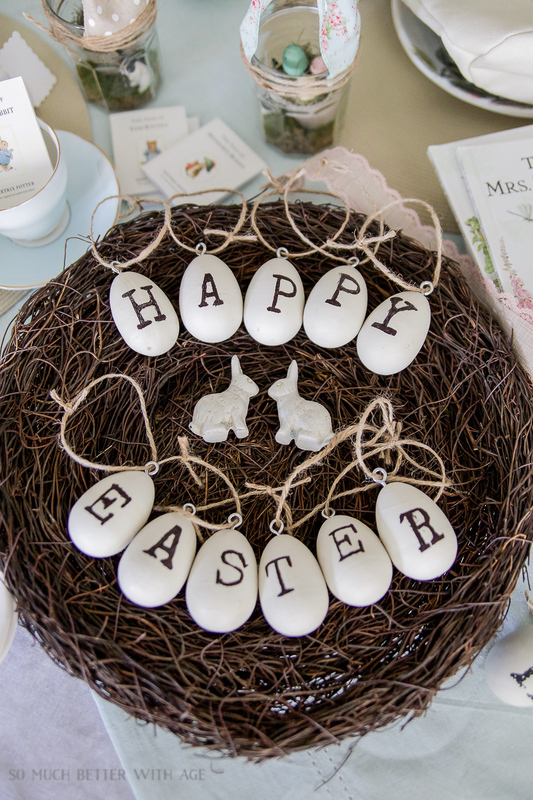 I like these better than the PB ones as the eyelet screws are facing forward for easy hanging on a garland. These ones got a bit wonky and I had to add tape to the top of the stick. Now you can hang them up on a stick for window decor. Or on something like the bunny sign that I made here. 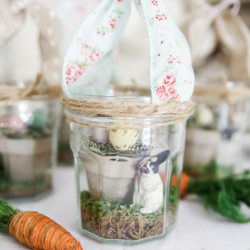 I hope you feel inspired to make your own vintage ‘Happy Easter’ eggs. Now be sure to visit all these wonderful blogger friends. This is really cool babe! Well done! 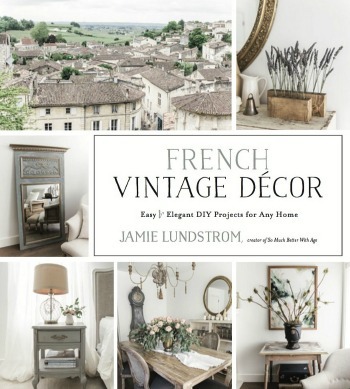 Jamie I am going to do this project – it turned out so pretty and can be decorated with in so many fun ways! Thanks so much for joining!! Thanks so much for having me, Annie! These are so neat. Love them. I love your eggs, I have not seen a post from ya, are you ok.
Not a problem, I sure have enjoyed the chit chat…..that makes you more real , makes you more like a friend. I like that. 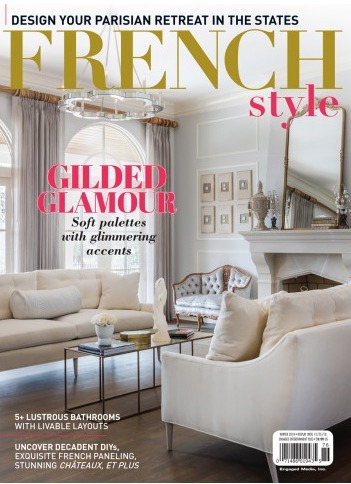 🙂 Thanks for the other website on French shopping. 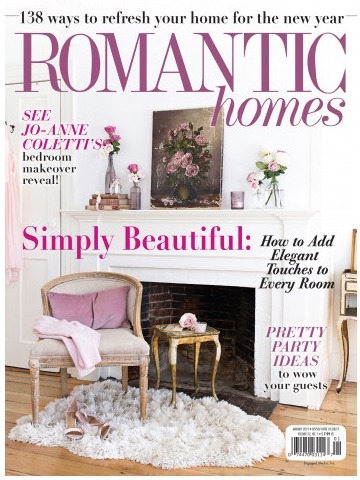 I subscribe to the site letter, I will be definitely ordering something maybe even a shopping tote! I so love them. Thanks Pamela! I totally get that, it’s nice to connect to a human being beyond the blog! 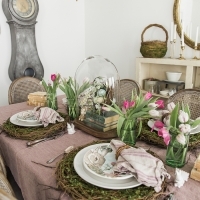 I just found this little site: https://shoppcbhome.com and recently bought the little wooden vases. 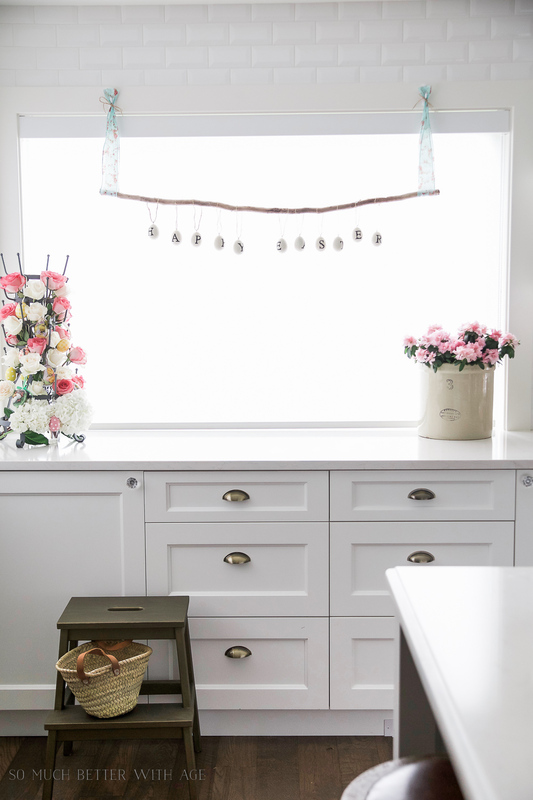 You can see them in my dining room post. I noticed them in dining room post, they are so cool looking. Thanks for sharing the site I went and signed up. They have so many cool things. and she also teaches calligraphy class’s , I love calligraphy, I taught my self, and just have not done it in years so I’m really rusty. Love the website. Very cute! Love how it looks hanging on the stick. Thanks Victoria! It was fun to make! Your tutorial is so helpful. Nice tip about not rubbing it on backwards, I would so do that! Love these,Pinning. So glad you shared with us at Merry Monday. I love this! Thanks for the tutorial. This is a definite must try! 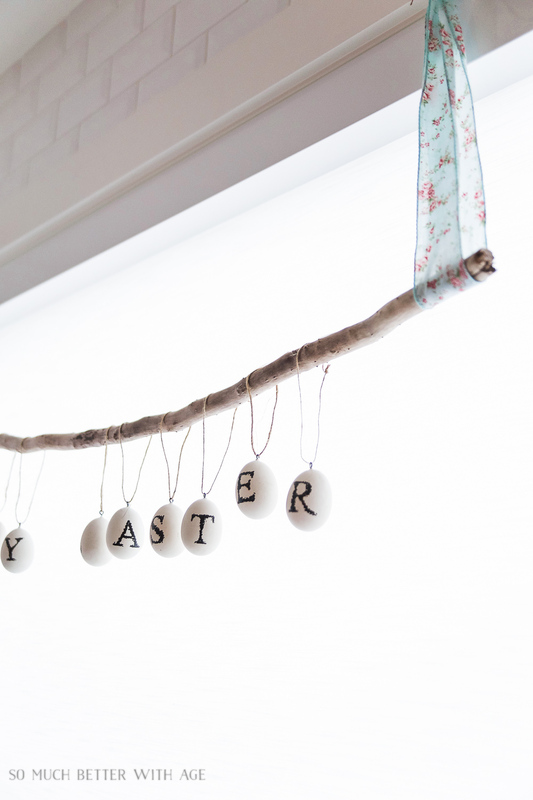 Hi Jamie, I really like the eggs hanging from a “natural” rod suspended by the ribbon in your window. Natural decor is always my favorite. I have a question. The eggs on the rod in the large picture, (3rd from the bottom) in this post, are they PB eggs or eggs you made using your download? 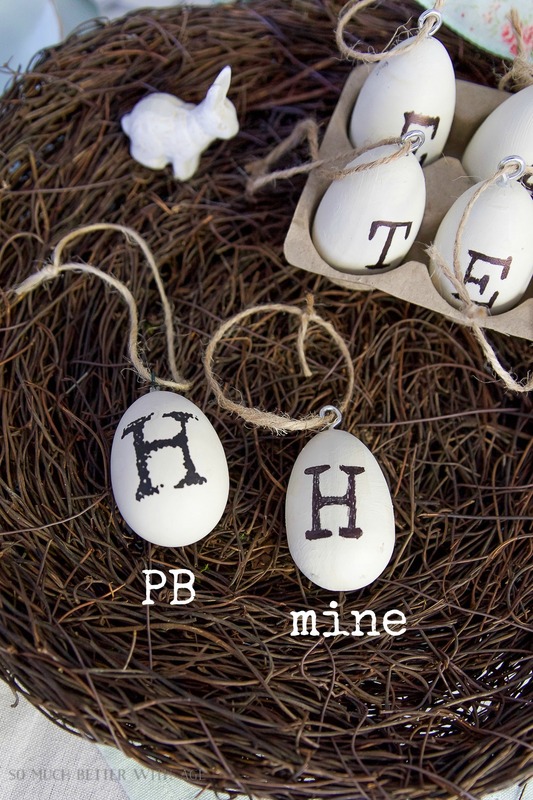 The font on the eggs in the picture looks a bit more “fuzzy” or vintage to me, I love that blurry vintage look, I can even make out an errant dot here and there. 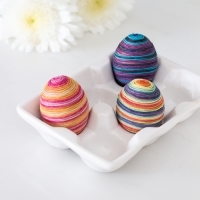 If they are PB eggs, I was wondering if there might be a way to achieve that look using your download? I’m thinking artist’s ink with a fine brush? Your crafting and decorating proficiency are 100% beyond my own, but my husband is pretty steady with brush and ink. If you think that would work, I’m always up for “begging”, “prodding” or “deal-making” with him. 🙂 As always, your creativity is so inspiring and I thank you for sharing your wonderful art! 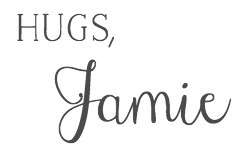 Thanks for helping me out with this one, Jamie. Using a fine tipped pen and dots is ingenious! I approached my husband with my brush and ink idea…well, he didn’t say, “yes- or no…”, he just kind of winced. I know he’ll go for the pen! Once again, your creativity overflows!